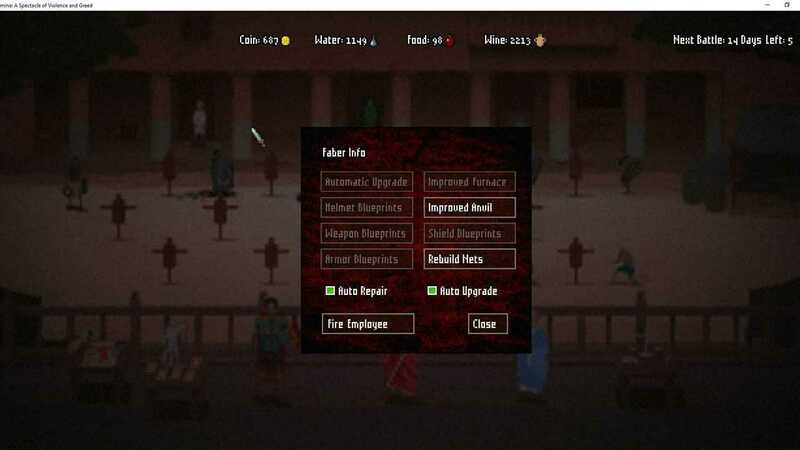 Domina is a Gladiator management game. The graphics are definitely stylish (a type of pixel art very popular at the time) and the music mixes modern rhythms with ancient sounds in an exceptional way. The gaming system is based on limited time and resources. Each day runs rather quickly and the player can play only a few activities. 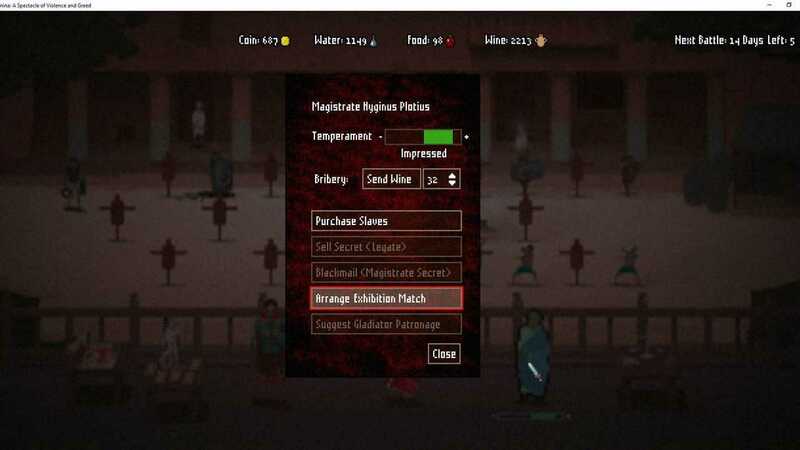 Training your fighters is essential, as is winning in the arena and obtaining prizes and resources that will allow us to better equip our gladiators and obtain favors from the authorities. The fights are always risky because no result is perfectly guaranteed and losing the best fighters is a tragedy from which you recover only with great difficulty, especially when you are defeated in fights between teams of gladiators. Over time their ludus will grow in celebrity (in case of success) and we can compete with increasingly complex challenges, including participation in tournaments in various parts of Italy of increasing difficulty against opponents. Finally, there are the touches of class as gladiators who get drunk in the arena (if you insist on rewarding them with wine during training), weapons launched by the public to help a fighter, severed limbs and the ability to post on facebook and twitter replays duels. But Domina also impresses with a different aspect from that of mere gameplay or production values. Domina is in fact a title designed to be played in a stream and offers several moments of meaningful interaction with the spectators. 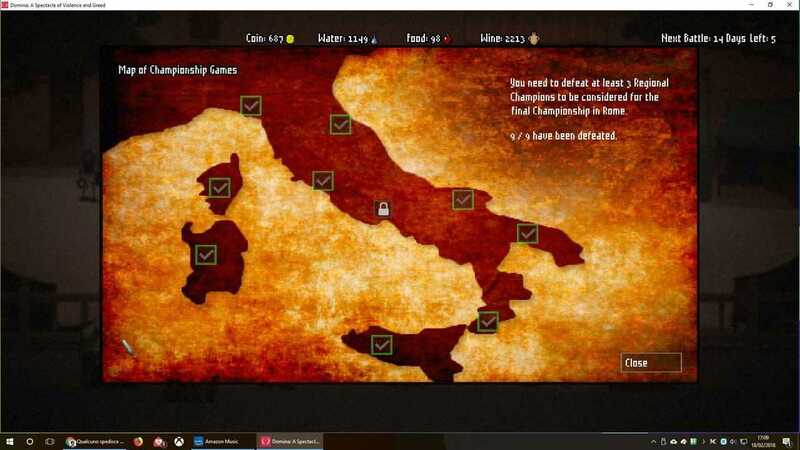 First of all, once the Twitch mode is activated, the game collects the names of the stream viewers and uses them for the various gladiators that the streamer manages during the game; both the first batch of fighters and all subsequent new arrivals will be identifiable as the stream viewers. Already this, by itself, allows Domina to acquire a new level of interaction with the public and, therefore, of entertainment. The viewers follow the story of their character, require training, new equipment and invoke the use in the arena. As has already happened in an unstructured way in games like X-Com (the streamer created the characters in the image and request of the viewers), so it happens in a structured and automatic way in Domina. But that is not all. 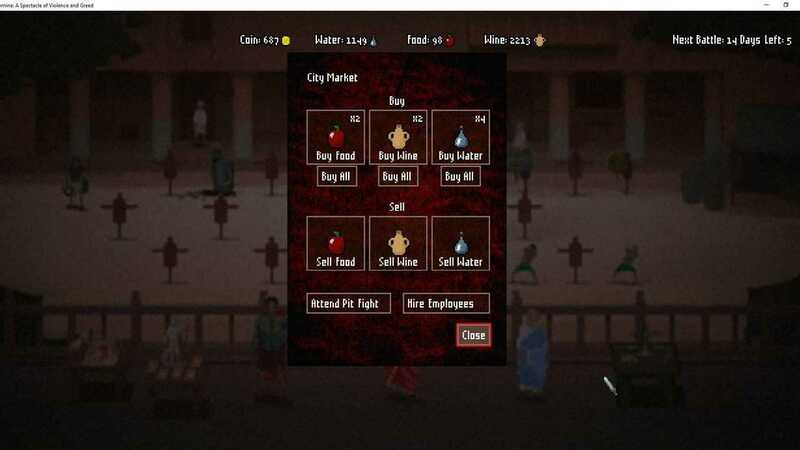 In Domina the viewers vote in the various multi-choice events proposed by the game using a mechanism similar to other ‘stream based’ games. And then you enter the arena and the fun is multiplied because not only spectators can participate by launching incitements and insults (thus determining other game statistics), but, in case a gladiator surrenders without being killed, they can vote for death or life through the classic thumb up / down. Copyright © 2014 - 2019 SocksCap64, All Rights Reserved. Logos, Trademarks, Pictures Belongs To Their Respected Owners. Powered By WordPress. 104 Queries in 0.549 seconds.